Who could resist a Luxurious Half Double Crochet Beanie Pattern to go with the Lady of Luxury Crochet Infinity Scarf? 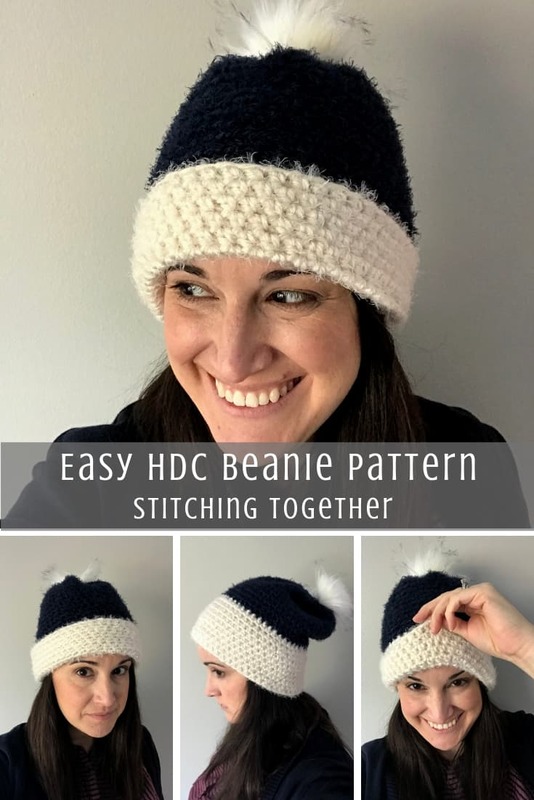 This HDC beanie is soft, comfy and best of all easy just like the scarf. 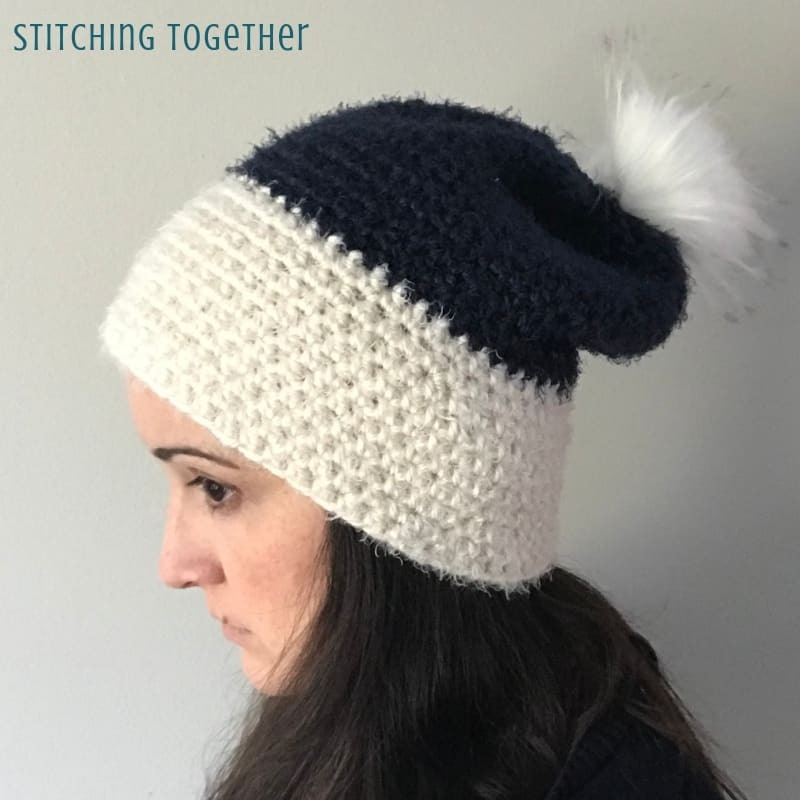 You’ll find basic stitches and construction making this a perfect project for beginners. Are you a top down or a bottom up hat person? I’ve come to realize that I am a bottom up person. Working from the bottom in the round or sewing together a rectangle just seems so much simpler than working a top down hat. 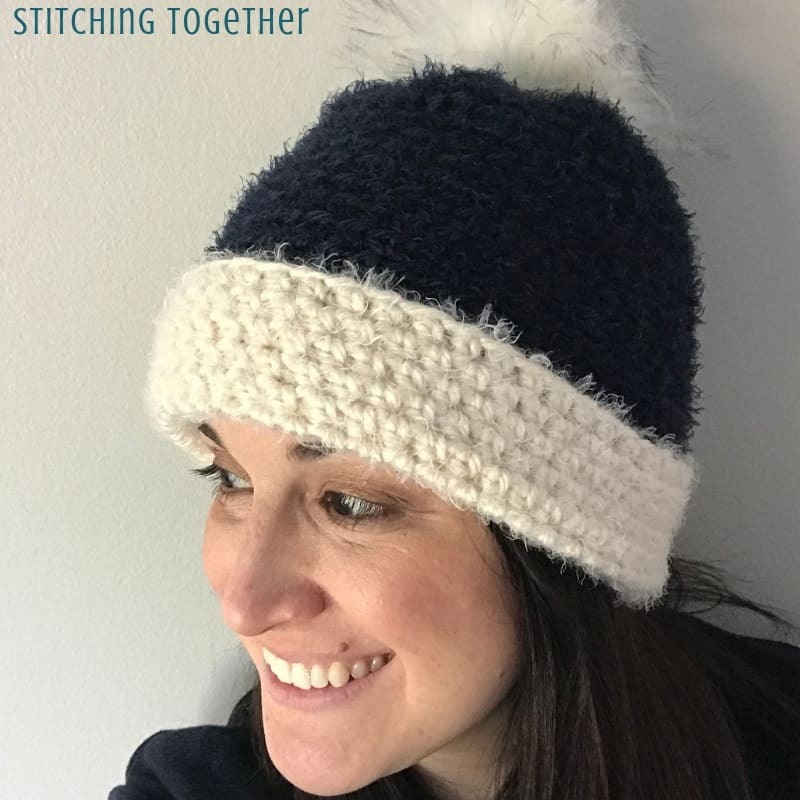 This hdc hat is made by working in the round and adding a couple of rounds of simple decreases in. It is nice and easy! 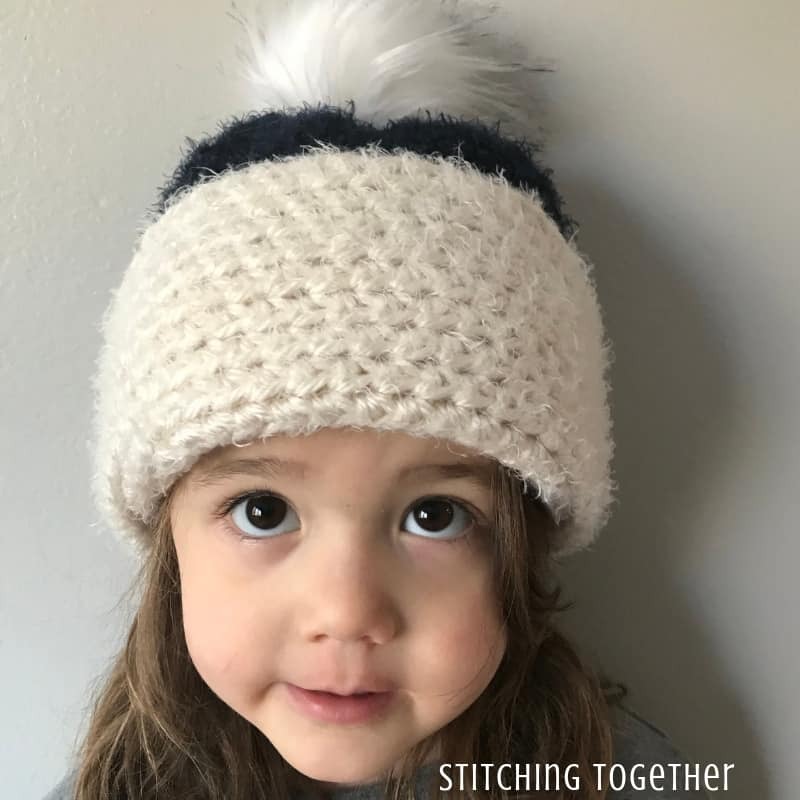 As I was planning the pattern, I couldn’t decide if I wanted the majority of the hat to be indigo or pearl, but I did know that I wanted the top to be indigo. 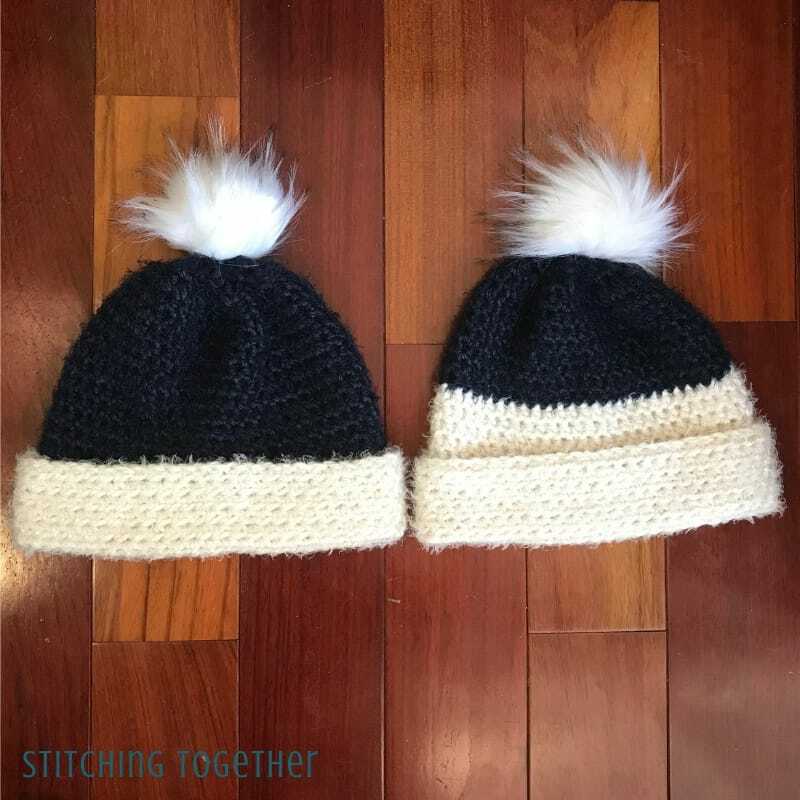 I had enough yarn that I didn’t have to decide so I just made both of them and wrote down both patterns! If you only buy one skein in each color, you’ll have enough to make one of each version, but you will not have enough yarn to make the same version twice. You may even have enough left over to make a fun blue pom pom if you don’t want to buy them. I’ve been really impressed with the faux fur pom poms I purchased on Amazon. A navy blue faux fur pom would look great as well. The beanie which has more indigo still has a wide pearl brim area which allows you to fold the brim up and make a wide or narrow brim. 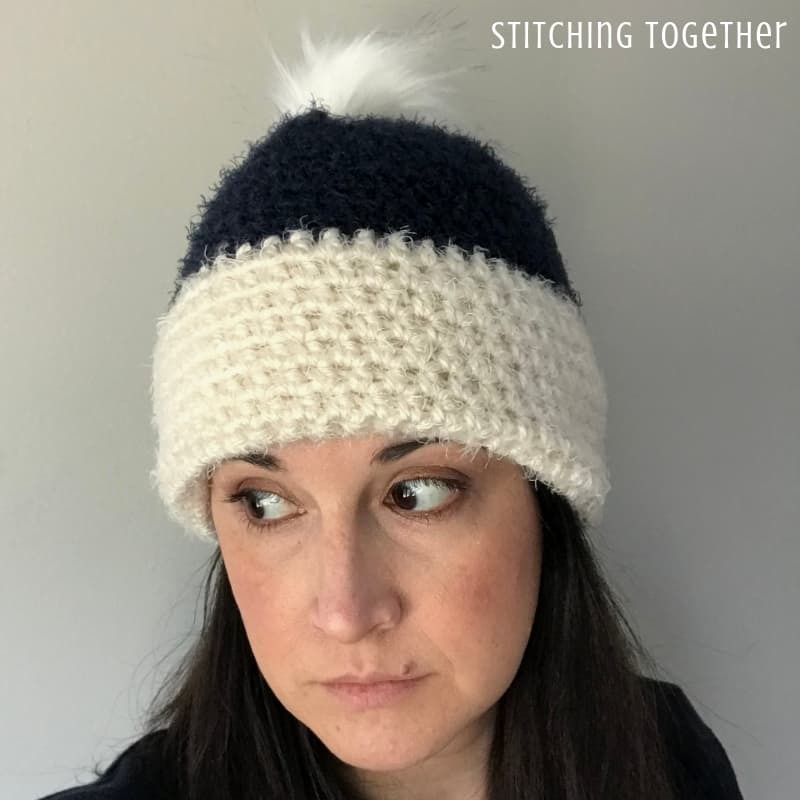 If you’d like to wear this as a half double crochet slouchy beanie, then the more indigo version works the best and looks super cute. The crochet beanie with more pearl actually turned out to be my favorite. (I think – I can’t decide – I keep going back and forth!) Folding the brim under to create a thick double brim while still maintaining a smooth hat looked even better than I expected. I don’t mind the bulky brim when it is folded up, but being able to fold it under and still get a great color block effect is wonderful! Ok, to summarize all of that: Both hats look great with the brim folded up, but the more indigo hat looks great as a slouchy beanie and the more pearl hat looks great with the brim folded under. The hat is worked from the bottom up with 2 rows of simple decreases at the end to help with shaping. Working in the back bump of the starting chain gives the best bottom edge which won’t pull or roll for the hat pattern. 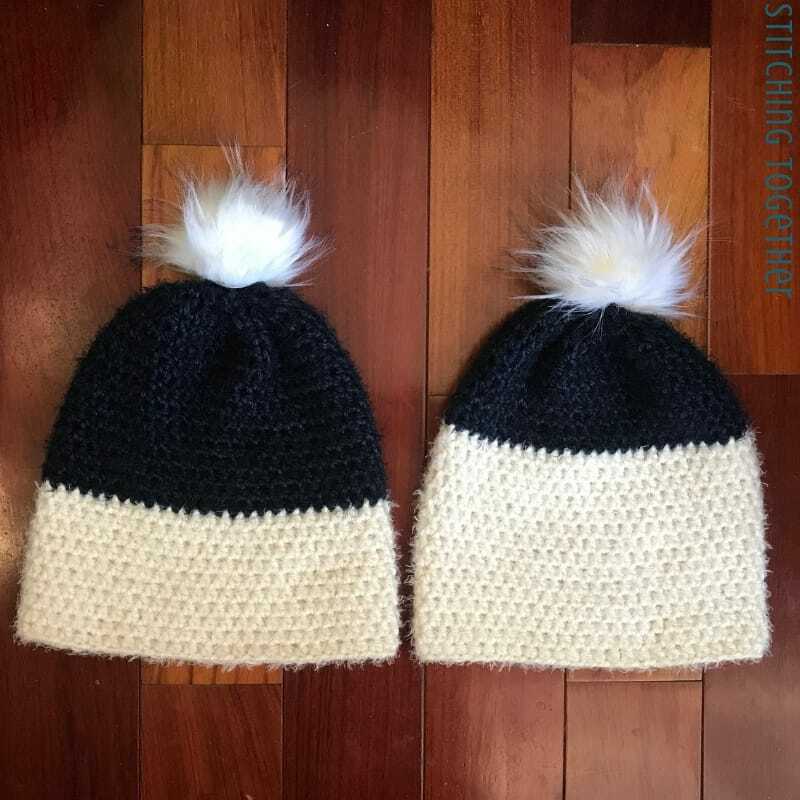 Version 1 and 2 are basically the same hat pattern with the color change in a different spot. 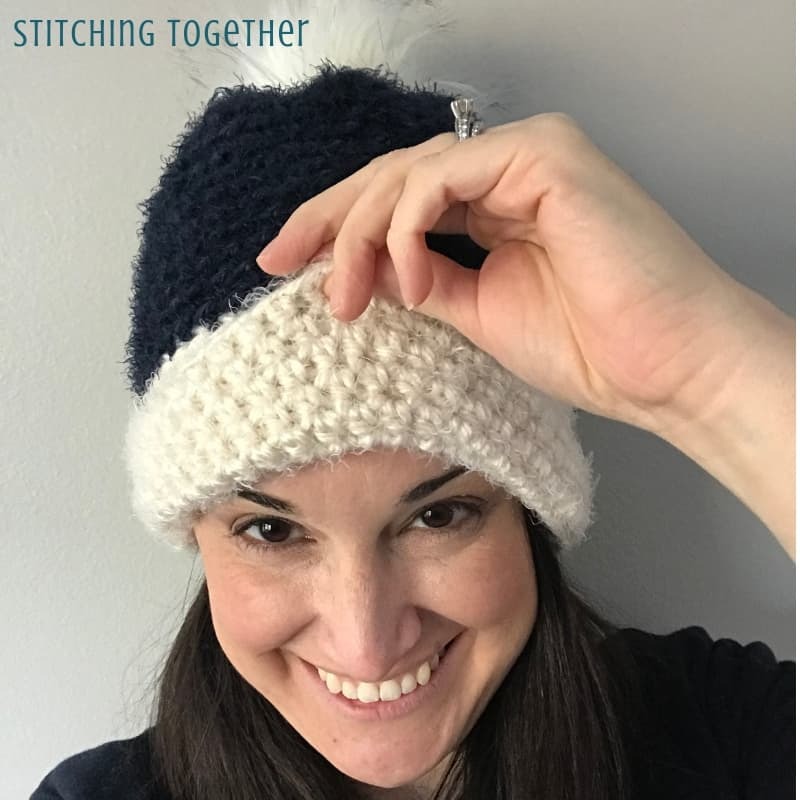 To make both half double crochet hats you’ll use almost the entire skein of both colors. To adjust the size, add or subtract an even number from the starting chain. You can use the ear warmer size chart to get an idea of sizes for adjusting. Half double crochet two together (hdc2tog): yo, insert hook into stitch, pull up loop, yo, insert hook into next stitch, pull up loop, yo and pull through all five loops on the hook. Ch 52 with Pearl, join with a sl st to form a circle being sure not to twist the chain. R24: hdc2tog around, join with sl st to the first hdc of the round. R25: hdc2tog around, join with sl st to the first hdc of the round. What are you waiting for? Grab your yarn and get started! Love it…could I do this with 4ply yarn. That should work! You’ll just need more yarn and probably a smaller hook. Enjoy!